I've been attempting to re-target the Animation Starter Pack's animations to the Advanced Locomotion System's skeleton, both being the standard Mannequin character with some slight differences.. The ALS Mannequin has a couple of virtual bones that I am wondering are messing up the re-targeting? Or maybe it is an IK bone setting that I am unaware of. Either way could someone help me troubleshoot the issue? All of the bones automatically map in the retarget manager, and the poses are nearly identical in the preview pane. The true issue is that, the Post Process Anim Blueprint in ALS named "Mannequin_PostProcess_AnimBP", does a bunch of things and it all relies on the IK bones being at the same exact position as the normal bones at any given frame. So if your animations don't have the ik bones following the normal bones, the legs and feet and sometimes other parts, don't preview correctly even though they are re-targeted correctly. Austinlele - This is why your solution of "using the normal feet bones in place of the IK in the retarget manager." made the problem go away. However, in that same Post Process Anim Blueprint, add two "Copy Bone" nodes in the Anim Graph. One for left foot and one for right foot. The source bones are the normal foot bones and targets are the ik foot bones. You want world space set, copy transform and copy rotation both to true. These two copy bone nodes get placed between the local-to-component node and transform modify bone pelvis node. This solution will copy the transform and rotational data of the normal bones to the respective ik bones during the post process so they are in fact at the same spot when ALS expects them to. Also you can find this solution and it's author "Vaei" in a thread for ALS on the unreal engine forums. Any thanks should go out to "Vaei"
Thanks to you, Vaei, Unit23 and monstercoo! 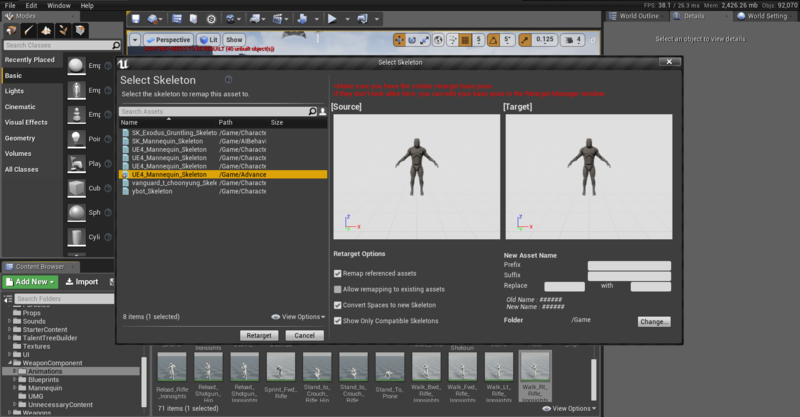 I'm also using the Advanced Locomotion System (ALS) from the marketplace and I had similar issues. It seemed like the only difference between the source and target skeleton were the virtual bones, so I assumed that was issue. However, it turned out that my animations were retargeting correctly, but the Foot IK was breaking the animation previews. You can disable Foot IK by modifying Mannequin_PostProcess_AnimBP and setting the default for "Enable Foot IK" to be false. This fixed my issue and animations appeared correct afterwards. I got mine to work by using the normal feet bones in place of the IK in the retarget manager. But that is more of a hack that I did.. So I'll mark yours as the answer.